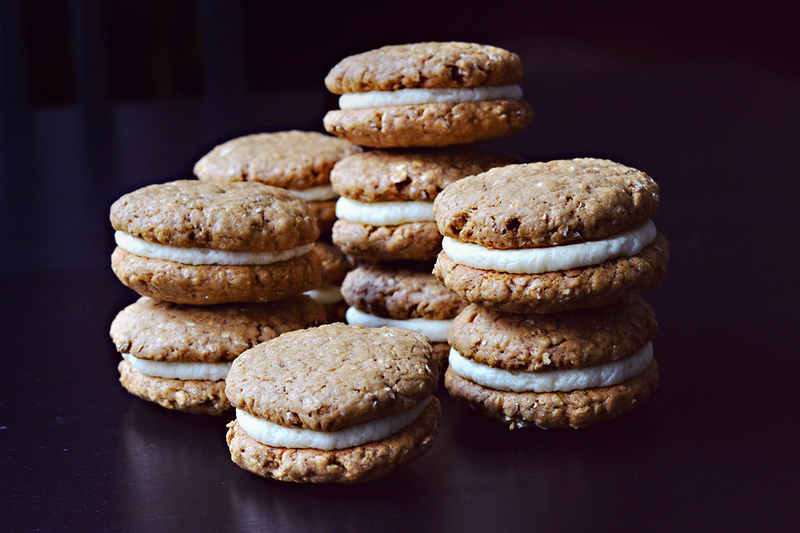 Two oatmeal cookies with buttercream frosting sandwiched between them. 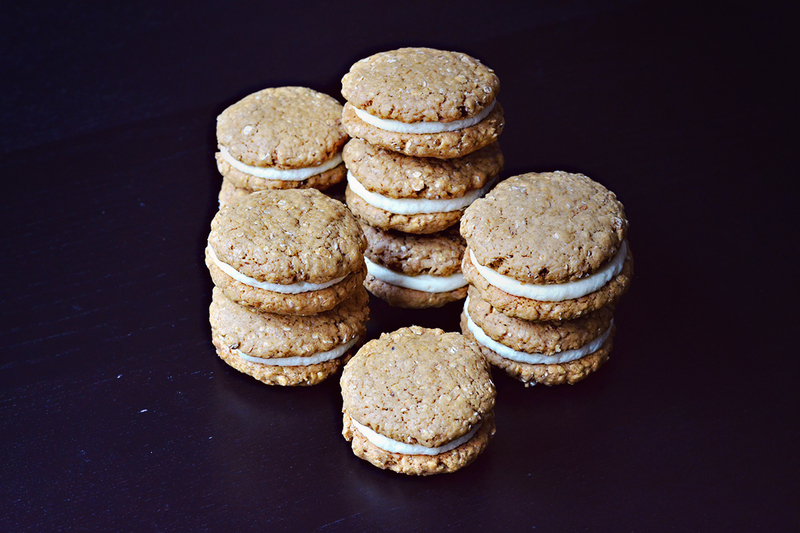 Yup, that’s oatmeal creme pies for you. 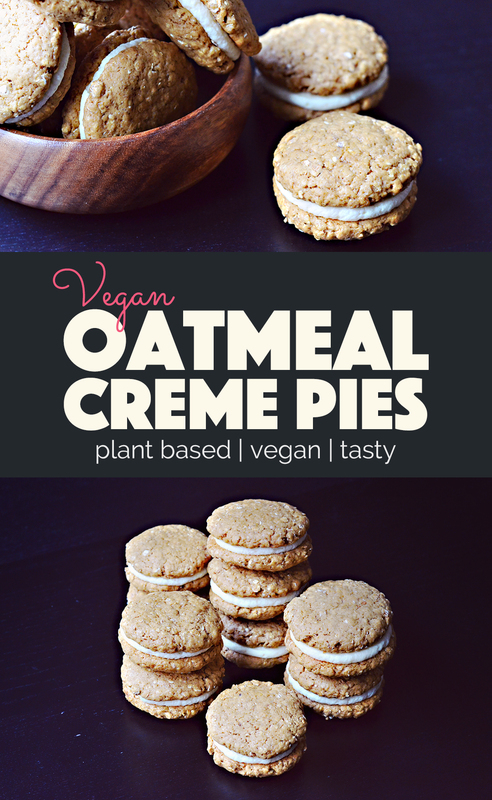 Pretty freakin’ delicious stuff if you ask me, even better when they’re vegan oatmeal creme pies. Picking favorites is difficult. Like picking a favorite cookie for example. There’s all kinds of things to take into consideration. Like your particular flavour preferences, level of sweetness, the texture (chewy or crunchy), does it have frosting or not? There’s many important factors to consider. 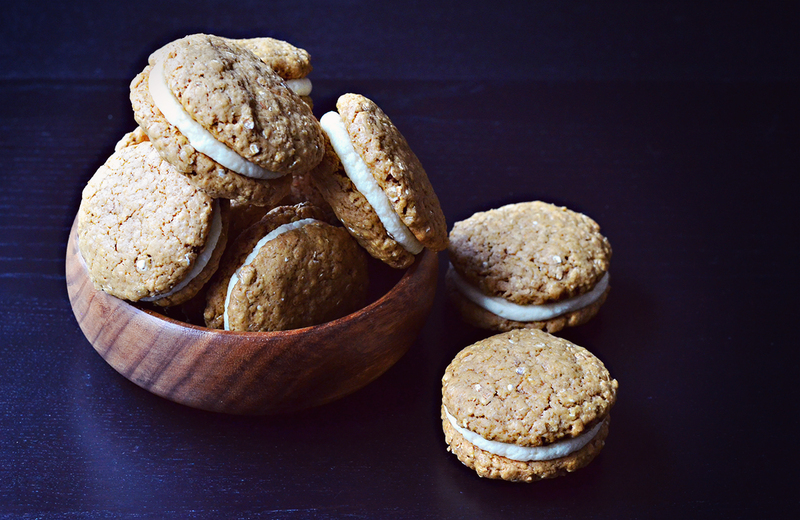 And then there’s the cookies your mom used to bake when you were a kid. They just cannot compete with any other cookie in the world. I mean, obviously, your mom is the best baker ever (I know mine is). And on top of that, whatever cookies you ate as a kid undoubtedly have a strong nostalgic connotation, making them impossible to compete with. 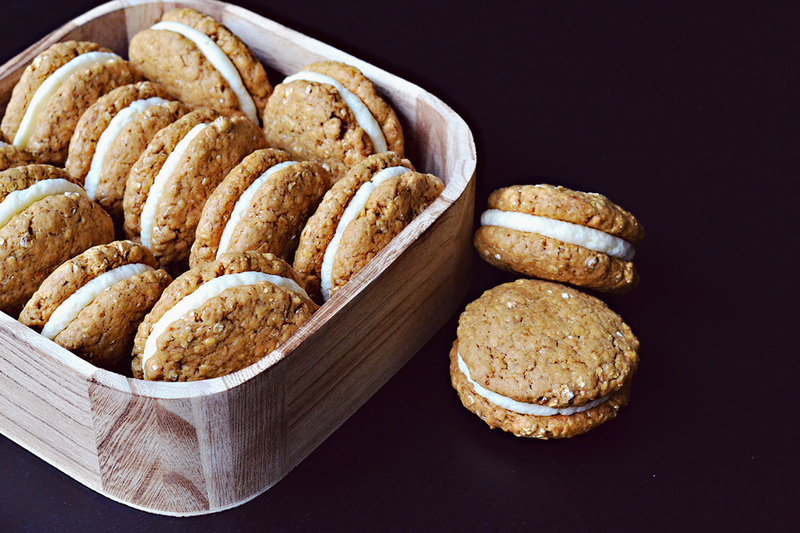 I discovered oatmeal creme pies somewhere in my teens at a farmer’s market one summer in Boston. And have since then introduced them to a lot of my friends who have adopted them as they’re absolute top cookies and ask me to bake them all the time. They’re one of my favorites too, but having said that, they simply cannot compete with my mom’s chocolate chip or peanut butter cookies. 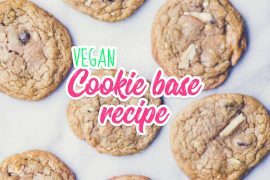 Either way, they’re frequently baked around here, which is why I’ve got a vegan recipe for them. Whether they’re what your mom always baked you as a kid or something you’ve never tried. 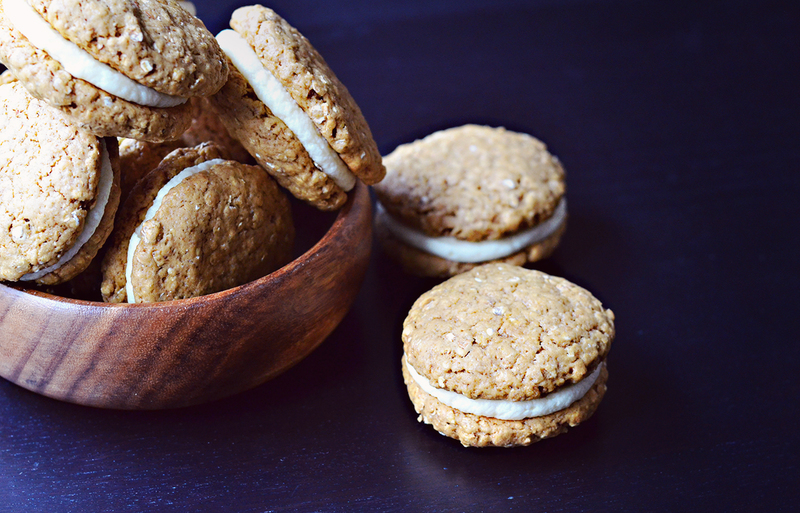 These vegan oatmeal creme pies should definitely be a part of your life. In a large bowl, whip together the butter, sugars, vanilla extract and soy yoghurt. In a separate bowl, mix together the flour, oats, salt, baking soda, and cinnamon. Combine the dry ingredients with the wet ingredients and knead together until completely mixed. Roll the dough into balls and then flatten into cookies and place on the baking tray, about 2 inches apart. Bake in the oven for 8-10 minutes. Be careful not to bake them too long, you want them to be slightly under baked and chewy. For the frosting: whip together all the ingredients, adding more milk/cream if the frosting is too thick. To assemble: spread frosting on the bottom of one cookie and sandwich with a second cookie. Chocolate chip, peanut butter cookies, cheese cake, brownies, kiwi cake ….. we DID have some good parties! Now you tweak everything to vegan – AMAZING!